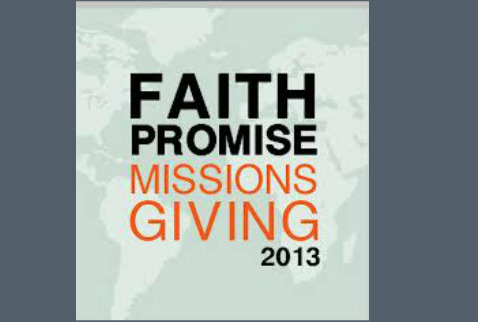 Scoll to the bottom to launch the Faith Promise Missions Giving Commitment Form or click on the image to the left. A Faith Promise Offering is a world missions offering that is given by faith. It is not based on what you have to give now or might have to give in the future. First, this offering is based upon faith in the Lord of the world harvest - Jesus Christ. Second, it is a world mission offering that is made as a promise to God. No one will ask for it. This promise is a personal mission goal that God has set for you through prayerful consideration. Third, it is a world mission offering that is given in addition to regular tithes and offerings. A tithe is understood as at least one-tenth of your income. This belongs to God and is given in your local church. Fourth, it is a world mission offering that enables every member and friend of the church to have a meaningful financial part in fulfilling the Great Commission. What a great opportunity and privilege! Fifth, it is a world mission offering that is given to others. It is an “others offering" that is given to those outside the local ministry of the church. Christianity in its truest Biblical form is always others. Is Faith Promise Missions Giving Scriptural? Acts 11:29-30 - This passage tells the story of each person in the church at Antioch participating in a cross-cultural offering. This predominantly Gentile church gave to Jewish churches in Judea. 1 Corinthians 16:1-2 - This passage is an admonishment for each person in the church at Corinth to give to missions each Sunday. The Faith Promise Offering for Missions is the amount you promise to give by faith, above your tithes, during the coming year to the world-evangelization program of your church. 1. The Faith Promise Offering is a biblical plan or method of giving. a. FAITH is surely biblical. We are saved by faith. We live by faith. We walk by faith. And without faith it is impossible to please God. Whatever is not of faith is sin (Romans 1:17; 2 Corinthians 5:7; Hebrews 11:6; Romans 14:23). b. PROMISE definitely has biblical support. “Vow, and pay unto the Lord your God: let all that be round about him bring presents unto him that ought to be feared” (Psalm 76:11). Promises or vows are very serious and are to be carefully performed, according to Ecclesiastes 5:2-5.
c. OFFERINGS are certainly biblical. Offerings were required under the law and are expected of believers in the age of grace. Israel was told that they had robbed God by not paying their tithes and offerings (Malachi 3:8-10). 2. Missions is at the very heart of our Faith Promise Offering. Christ died for the whole world. It isn’t His will that any should perish. c. They need to be told of Christ’s provision for their salvation. d. They cannot hear without a preacher. e. The preachers must be sent. f. We, the local church, are the senders. g. Sending means more than praying: It means providing financial support. 3. The Faith Promise Offering is over and above your tithes (Malachi 3:8-10). 4. The Faith Promise Offering is based upon faith. It means that you will trust the Lord to enable you to give it (2 Corinthians 9:8-10).